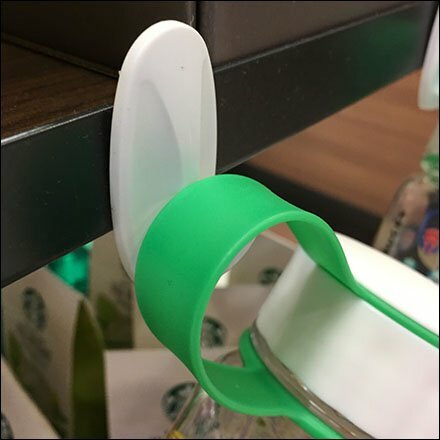 Seen with Starbucks merchandise on the shelves, this Water Bottle Merchandising by Command Strip adds a secondary cross sell. Of course they could be coffee carriers and not water bottles. But the fixture focus is the creation of hang points and auxiliary hooks by use of Command Strip outfitting. Look close to see that even though the Command Strips are larger than the shelf edge, they grip well enough to create the cross sell. this Water Bottle Merchandising by Command Strip seen at a Target at King of Prussia PA, adjacent to the in-store Starbucks Cafe. “Water Bottles Pinterest Board“ summary. “Water Bottles Index Page” for all resources and links.